HEADACHE BUSTER :Capsaicin has been shown previously to reduce nasal complaints in patients with a non-allergic non-infectious perennial rhinitis. Proposed pathophysiological mechanisms for non-allergic non-infectious perennial rhinitis include a chronic inflammatory disorder of an antigenic or neurogenic nature as well as the possibility of a functional neuronal disorder. We hypothesized that the beneficial effect of capsaicin might be the result of a down-regulation of inflammation (by a reduction of inflammatory cells) or through modulation of neural tissue density. .o0(KAPOW!) .o0(BANG!) .o(WHAM!) That headache with HeadAche Buster! This stuff is Truly Amazing! 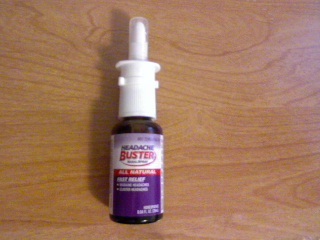 the day after reciving this from Buster Brands my husband recived a headache ALL day LONG. He isn't the type of person that likes taking medication for ANYTHING if he doesn't have too. He would rather wait it out then take a pill. So to my shock he asked for the Headache Buster I recived. He used it in both nostral's his eyes got BIG and his face turned a little red and he was like WOW! safe to say he scared me and gave me a mini stroke because I didn't know what was happening. Then he was like Wow! That burned a little. I'm sure that the capsaicin in it had a little something to do with it! But within (SECONDS) literally seconds! 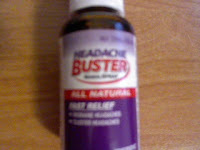 of him using Headache buster the headache went away. I seriously couldn't belive it. Then a few day's later he had another headache (Stress) Headache and he used it. Same reaction. A slight burn then BAM! seconds later.. bye bye headache! I wish I had discovered this sooner! The bottle is made out of thick glass so unless you just throw it against the wall there is a minimal chance that it will break. The bottle size is 0.68 FL.oz. (20mL) Homeopathic Medicine. 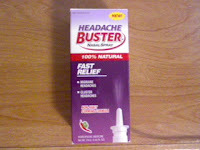 Buster Brands has tons of different products (besides) headache buster! I was given the chance to choose the product I wanted and My small family has headaches more often then Colds or Allergy's. Which is 2 of 7 of their products!. So you can choose what fit's you and your family the best. You can find Buster Brand's product's here Buster Brands You can buy Headache Buster here Shop Buster Brands for $14.99 Trust me, You won't regret it!. ♥ I receive no monetary compensation for this review. I was provided a Headache Buster to try and give my honest opinion.